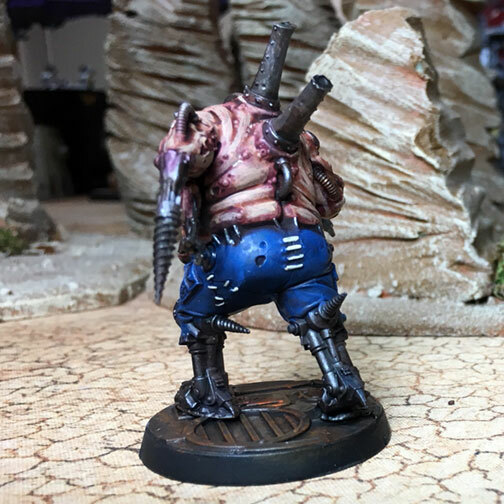 Warhammer 40,000 – For some of my regular clients I offer a rush service. For a slight premium they can get bumped to the front of my queue. This option is very popular with some of my more tournament minded clients who have crazy list ideas pop into their head and need a few models to add to their existing force. Warhammer 40,000 – Death Guard continues to be on the top of my commission list. It seems to be flu season or something with all the infected that are crossing my paint desk lately. The most recent batch include some of the tracked guns, a landraider and a group of Terminators with scythes. Warhammer 40,000 – There are few models more hideous that the metal Fleshhounds of Khorne. Even the new plastics that have been revealed aren’t my cup of tea. Something about the neck frills just doesn’t do it for me. And event though I think a Daemon Prince or Bloodthirster leading a pack of hounds would be cool and effective on the table the look of the models didn’t fit with my army so I never pursued it. 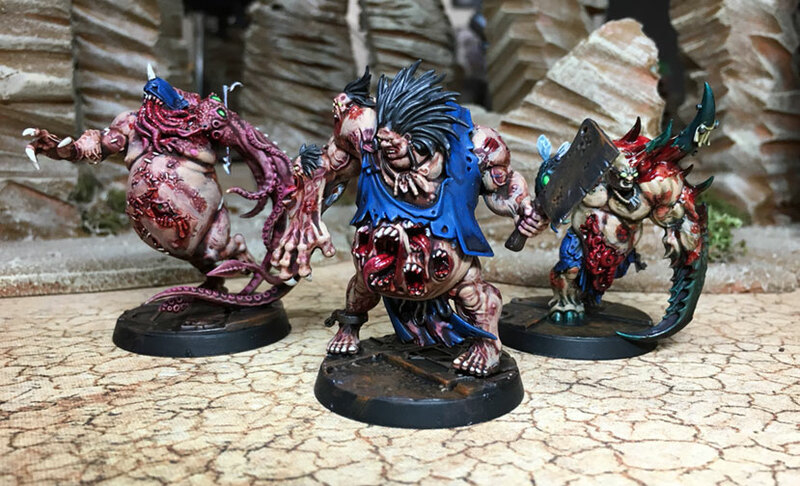 The latest gem to hit my table is a small unit of Legion of the Damned. These guys made a big splash in the standard marine codex a few years back with some updated metal sculpts. During the insanity that was sixth/seventh edition they even got their own “codex” now relegated to a tiny index entry you rarely see them on the table. Warhammer 40,000 – One of my clients loves finding old models. He works in a Friendly Local Gamestore (FLGS) and always seems to come across good deals for guys getting out of the hobby with ancient models. These models eventually find their way to my table to get painted up to match one of his existing armies. This time around we have Marnies Calgar on a throne, several Tech-marines (The Hands of Mars) and several Chaplains. All of these are destined to get the “bright” Salamanders scheme to match up with the rest of his force. This is the same client that I did the Terminators through the ages job so it’s fun seeing this variety of model in one army. 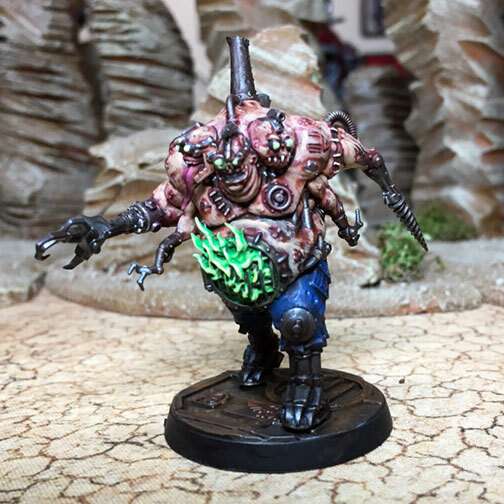 Warhammer 40,000 – The Death Guard has been very popular with my clients as of late. 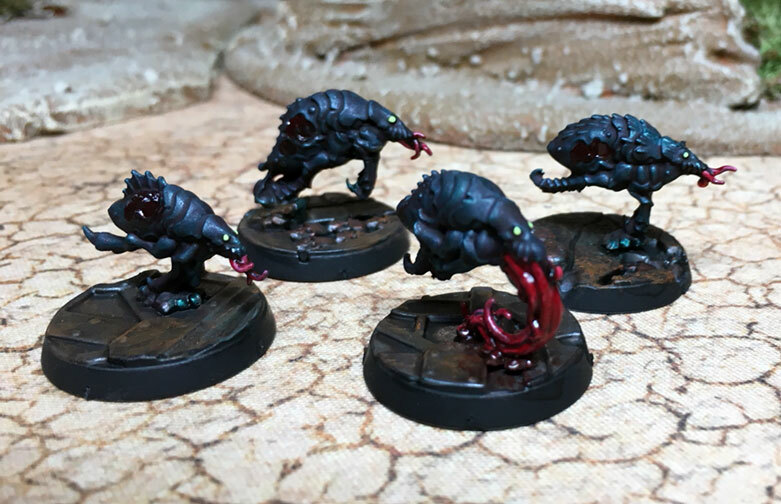 I doubt that the fact the core models were easy to acquire in the core box for a discount is the only reason I’ve seen an uptick in commission requests for these followers of the Plague God. 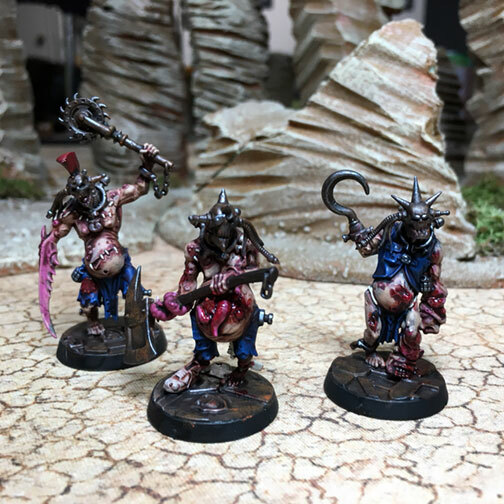 I think having a resilient force able to hold objectives or tarpit your opponent is probably the more likely reason these guys are finally getting some love from my clients. Warhammer 40,000 – Last year about this time I painted up an Emperor’s Talons force of Custodes and Sisters of Silence. Since that time the Custodes book has been released as a stand-alone codex with a host of new models. Warhammer 40,000 – Hivefleet Leviathan has spawned a few new beasties to aid in their consumption of the galaxy. One of my long-standing commission clients decided to add a large batch of models to his army to fill out his list for an upcoming GT. 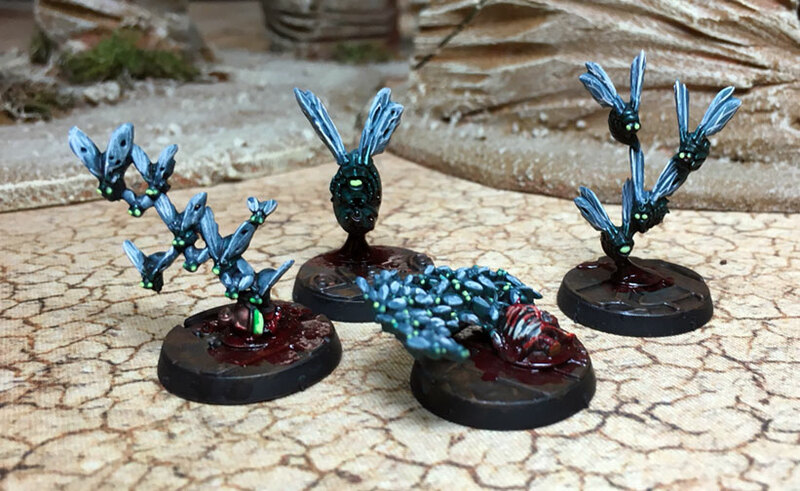 This batch includes some Spore Mines to annoy opponents, 26 Genestealers to rip apart opponents and a second Flying Hive Tyrant to lay waste to troops at range. Warhammer 40,000– I really like the Open War Deck. It’s a quick way to set up a game that tends to be different every time you play. Unlike Maelstrom of War the objectives tend to be simple and fixed so there is more “skill” and less “luck of the draw.” Although some of the mission combinations you can get with the Open War deck are pretty ridiculous at least both players have to deal with the bad flips. Warhammer 40,000 – Weekly game night should be getting back on track with Fall right around the corner. I've been lucky enough to get a game in every week this summer and I've been enjoying tinkering with an Imperial Crusade list. Yes, I can hear your moans it consists of Astra Militarum: Catachans, Blood Angels and House Raven. Warhammer 40,000 – Every time I sat down to work on Mortarion, the Primarch of theDeath Guard this old Esham song from a B-movie soundtrack kept running through my head. It got so bad I had to break down and buy the damn thing. Check it out and see how bad it sticks in your head. Warhammer 40,000 – I love big events. They always turn into "brand-new" armies from my clients. 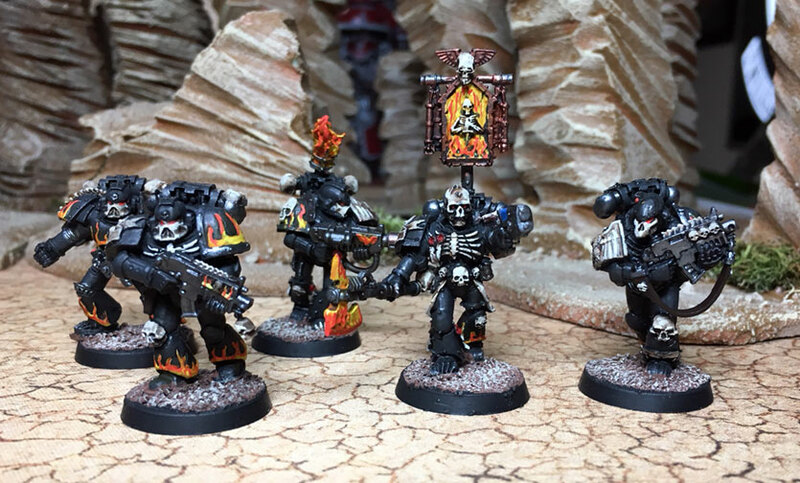 The latest big event inspired list is for one of my Black Legion clients. He decided to add some Renegade Knights and Death Guard to his force. I jumped at the chance to do an alternate scheme Death Guard as the green/white, rotten green color scheme is everywhere right now. As with the Khorne elements I painted for him previously the god-specific helmet color is what sets them apart from the rest of the force. Warhammer 40,000 – So command points are super important in most codex armies in 8th edition 40K. Mixing armies seems to also be pretty important to build the most effective fighting force. I've never been a huge fan of Imperial Guard but I recently read the Rogue Trader Omnibus and found the Guard unit that the main character joined up with to fight the Tau interesting. I really enjoyed how the novels paired Space Marines, Guard, Knights/Titans, Inquisitors, Priests and Rogue traders together in a Crusade force. Seeing how they worked together inspired me to make an Imperial force. Now since soup is dead mixing armies with only 3 detachments is tricky. Particularly if you want to include Agents of the Imperium (it's pretty sad that the cool fluffy Imperium keyword got beat down for competitive play, but whatever) so I won't be able to include everything I want in a single force but perhaps I can make several elements so I can pull from the various factions taking part in my Crusade. Sternguard and Drop Pods – Can they work? Warhammer 40,000 – When Sternguard first came out I was a huge fan of the unit. I converted up two full ten man squads to run alongside Pedro Kantor and cause people now end of headaches when they dropped in guns blazing. Their current iteration is doesn't look amazing on paper but I'm determined to make them work. I also loved drop pods when they came out I own enough for a battle company to drop in with ease. Sadly that can't happen any more due to changes in the "match-play" rules, which it seems is the preferred guidelines for how to play among the people I play with. I think two pods might do the trick and depending on how things go during deployment I can decide if anyone goes in the pod or not.